Saturdays are the days I cook the most in our house. Kevin tends to cook for the whole week so I agreed to give him one day of rest from out kitchen. This Saturday I felt myself wanting to make something different. I had some boneless chicken breasts and did what many do…headed to Google for a suggestion of what I could make today. Google search of boneless chicken breasts returned with this recipe suggestion. I am beginning to think I should just start at Canadian Living when looking for recipes as when they come up in the search list it always sounds like a winner. I had the ingredients on hand for this one for the most part. I just went with the pasta and baby spinach I had on hand. I also love mushrooms so chopped up a cup of them to add. I got more than enough lemon juice from the one lemon I used for the grated lemon peel. 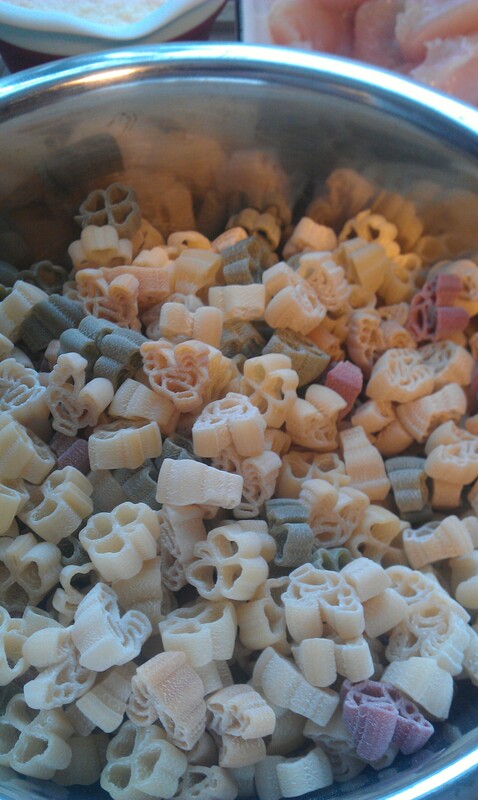 My chicken and shamrock shaped pasta I bought in a fundraiser. I didn’t have any penne on had but I had purchased some shaped pasta from a fundraiser and decided that this could be a fun way to use it up as the kids were going to be eating this. So it was going to be a blend of chicken/shamrock shapes. It boiled up well and was al dente after about 8 minutes of boiling. It also didn’t stick too badly so I didn’t end up with a huge lump of pasta to work with. Chicken in the pan with butter. I keep a kitchen scale on top of my microwave so I followed the directions and weighed out the proper amount of chicken. Turns out that 2 chicken breasts purchased from Costco weigh just over a pound (16 ounces) and I was cooking for 5 (Kevin, myself, almost 10 year old, 7 year old and 3 year old) and my younger two kids share a serving between them I figured a bit more chicken couldn’t be too bad. 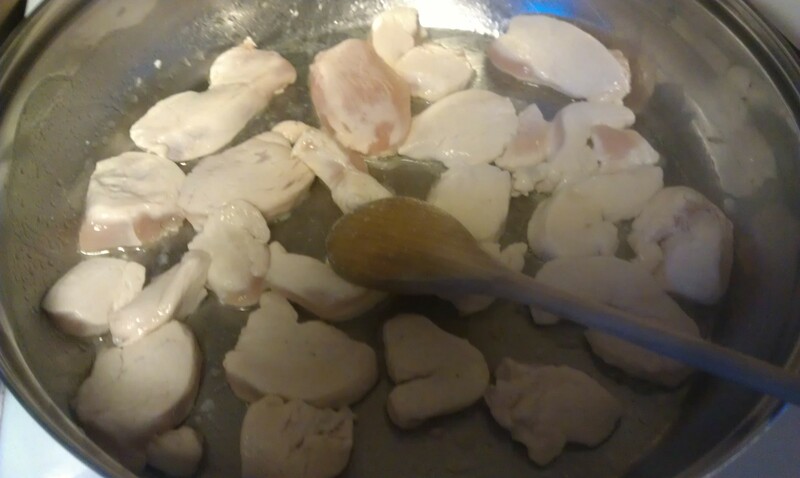 As I was cooking the chicken though I noticed some of my pieces seemed a bit large so I took the time to cut some of them in half so they were more like strips of chicken rather than chunks. 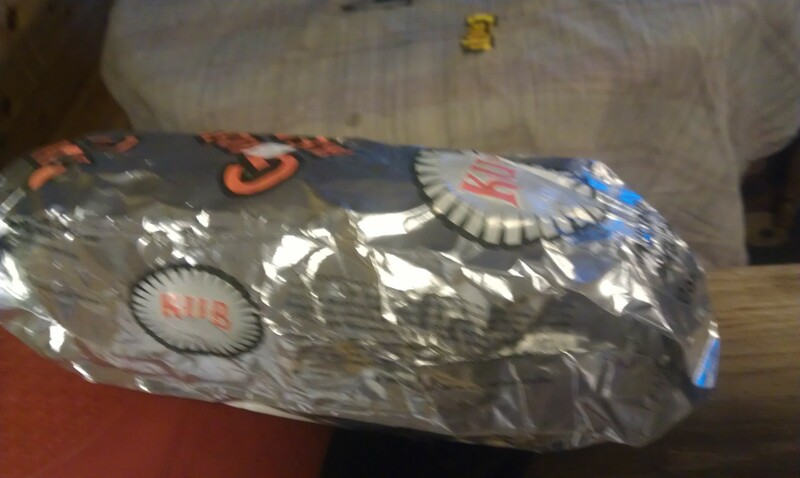 KUB foil wrapped garlic bread. When I started melting the butter in my pan I started my oven for the garlic bread I was going to pair dinner with. I like to go with this particular style of garlic bread. I found it timed well. When I pulled the pasta dish off the stove to serve the bread was ready to be served as well. Chicken with the addition of garlic and mushrooms. When the chicken was cooked through I added the minced garlic. I have a garlic press from Tupperware that I just love and is not only easy to use but easy to clean. We’ve had it for about a year and when I first bought it I didn’t think it would get used as much as it does…sometimes daily. 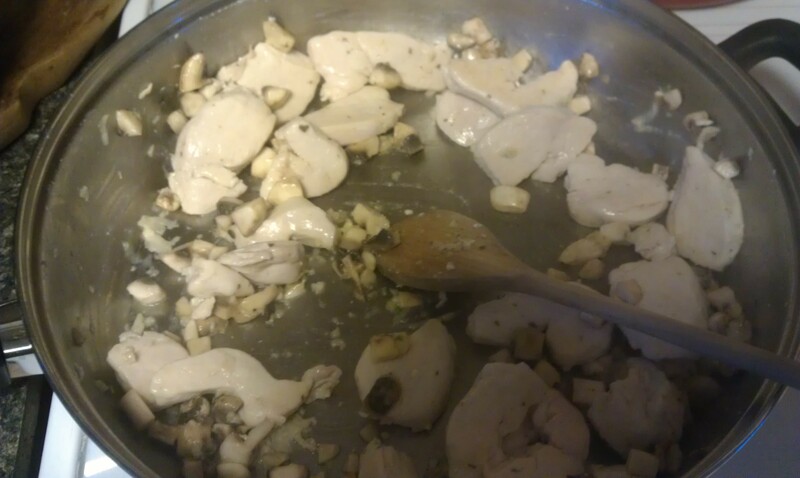 At this time I also put my mushrooms in to soften with the garlic. This was an addition I decided to go with on the fly. 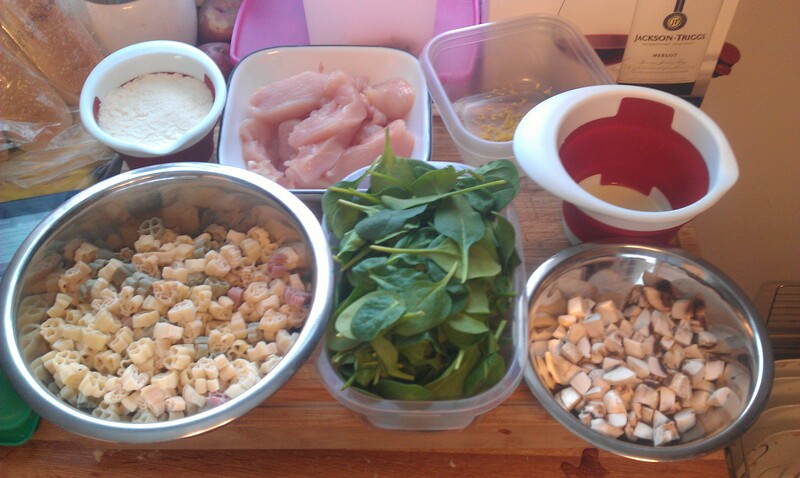 Adding the remaining ingredients – minus the spinach. To be honest if I had had some dry white wine in the house I would have put a tablespoon or two in the pan before adding everything else in Step 3. I think it would have given a nice flavour. 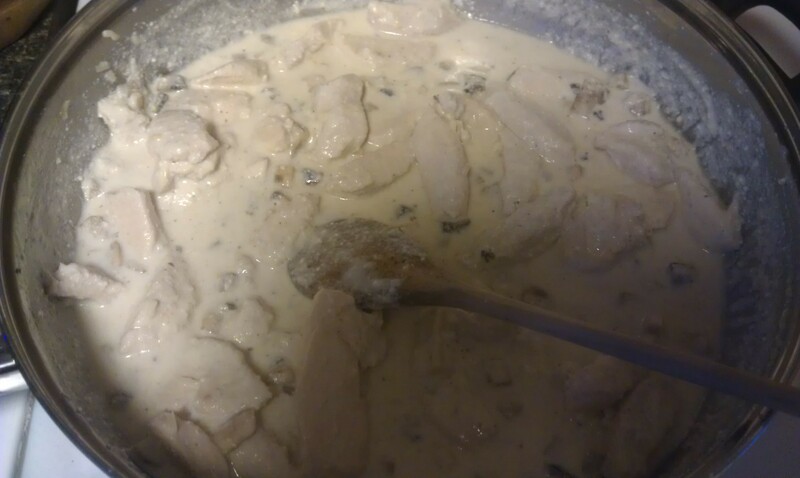 The ricotta melted nicely and it became a very creamy sauce with the chicken, garlic and mushrooms. Baby spinach in to the pan. I love cooking with spinach when I can. I have picky eaters but they will gobble spinach down if it is served in a tasty way. I liked the fact that this recipe was light using ricotta to build the sauce and then the added benefit of getting some fresh dark leafy greens into my kids. When I am cooking with something that requires you to walk away and let it do it’s thing I find I’m a bit of a helicopter cook. I’m often trying to keep busy and resist the urge to be constantly stirring it when leaving it be is the right course of action. Wilted down spinach. Almost done. 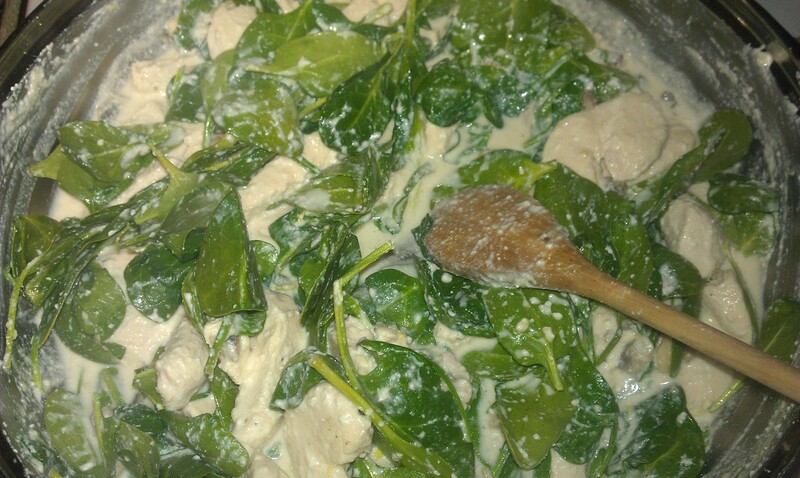 As the spinach wilts down the water adds even more liquid to the sauce and it stays creamy. When I add the prepared pasta into the pan to toss and finish the dish the pasta soaks up a good majority of the liquid. Finished meal with the pasta and parmesan cheese added in. The reactions from the family were positive. I didn’t get the lemon notes as much as I was hoping to but I’ve also been sick for the last week and my palate isn’t where it needs to be yet either. The three kids enjoyed the meal and ate it quickly and enthusiastically. There was enough for seconds for a few and lunch for me on Monday. In large pot of boiling salted water, cook pasta for 8 to 10 minutes or until tender but firm. Drain and return to pot, reserving 1/2 cup (125 mL) of the cooking liquid. Meanwhile, cut chicken breasts crosswise into slices. In nonstick skillet, melt butter over medium-high heat; brown chicken, stirring occasionally, about 5 minutes. Add garlic; cook, stirring, for 1 minute. Add reserved cooking liquid, ricotta cheese, half of the Parmesan cheese, the lemon rind and juice, salt, pepper and nutmeg; bring to simmer. Add spinach; stir until wilted. Add to pasta and toss to coat. Serve sprinkled with remaining Parmesan cheese. 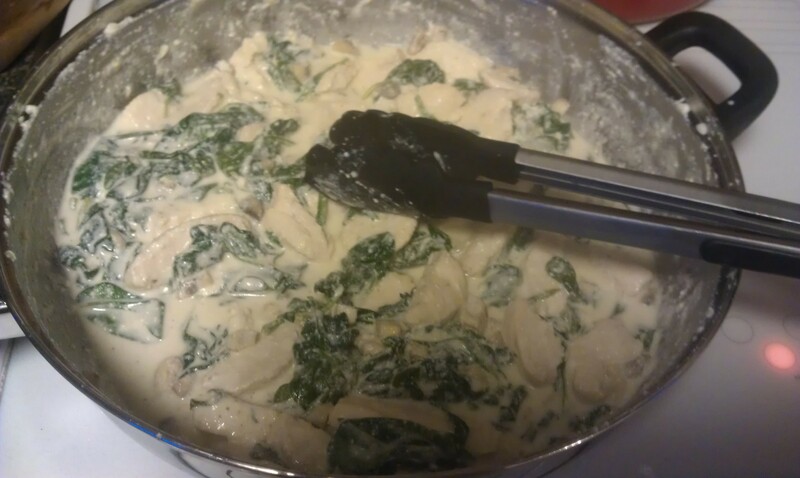 Posted on February 10, 2013 by Shirley Robert	• This entry was posted in Cooking with Kids, Recipes and tagged baby spinach, boneless skinless chicken breasts, canadian. 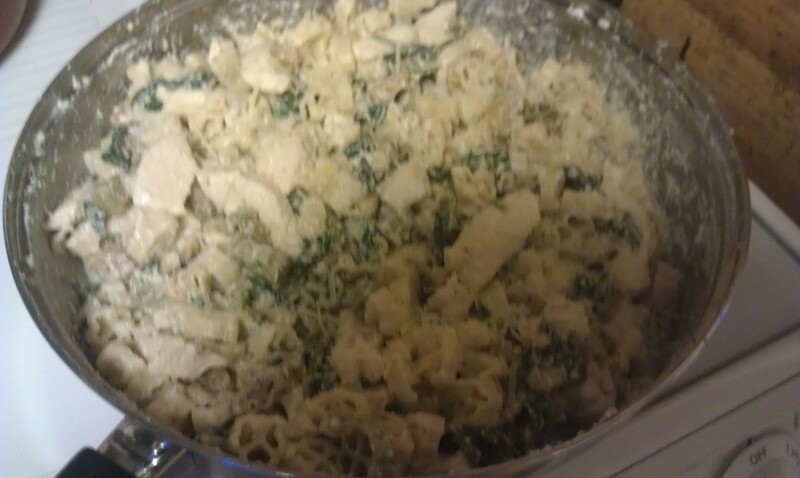 living, chicken breasts, Google, lemon, pasta, ricotta, spinach. Bookmark the permalink.